When learning about the basic anatomy of the brain, one of the hardest parts is getting a hang of the anatomical terminology. This study guide will go over each terminology group, as well as review the locations of the major parts of the brain that were discussed in the lesson plan for basic brain anatomy. The first group of anatomical terminology is superior and inferior. Think about what each word means: superior means best, and inferior means worse. 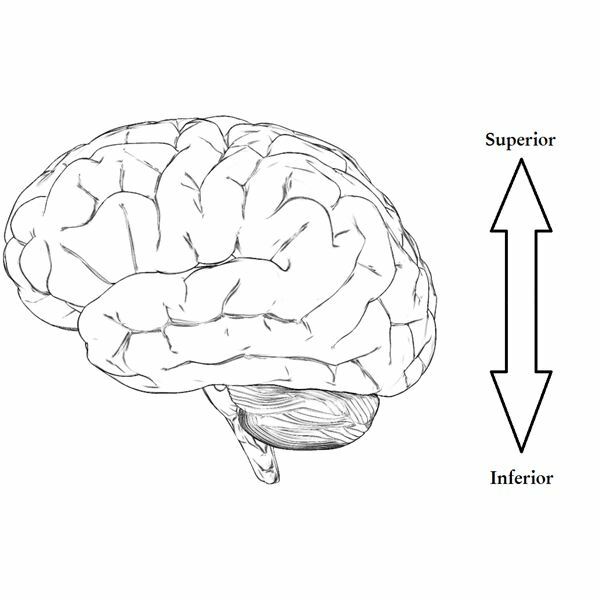 Use this to remember what location they are referring to: superior is at the top of the head, while inferior is at the bottom of the head. Visual imagery can help with remembering: draw an arrow up and down along side a brain and label where each term goes. The second group of anatomical terminology is anterior and posterior. Once again, think about what each word means: anterior means front, and posterior means back. Use this to remember what location they are referring to: anterior is at the forehead, while posterior is at the back of the head. Be careful not to confuse these terms with superior and inferior. When using visual model, take an image of the brain from the side (where you see all four lobes of the brain) and label accordingly. One thing to note when studying is that anterior and posterior have synonyms: ventral also refers to the front of the head, and dorsal also refers to the back of the head. Your teacher may ask questions that interchange these words, so make sure you know both sets. 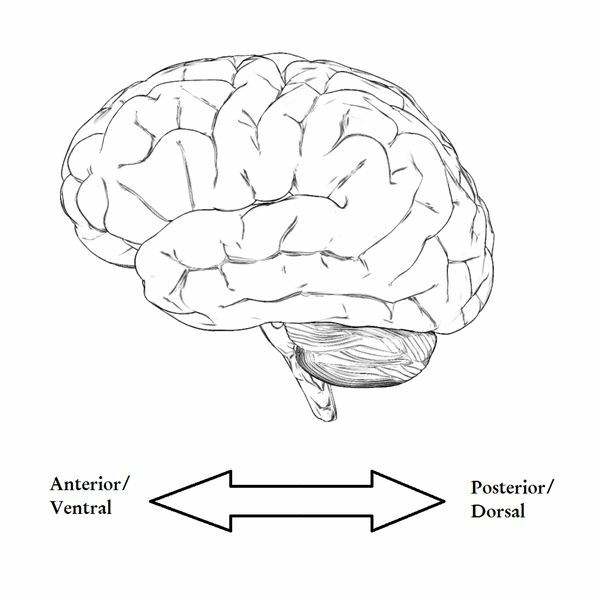 To help, write “ventral" and “dorsal" alongside “anterior" and “posterior" in your diagram. The last group of anatomical terminology in basic brain anatomy is medial and lateral. These terms can be more difficult to remember, as the anatomy lesson has not covered the internal structures of the brain. But learning them now will give you a head start for that lesson. Medial and lateral refer to an invisible line that is drawn through the brain. 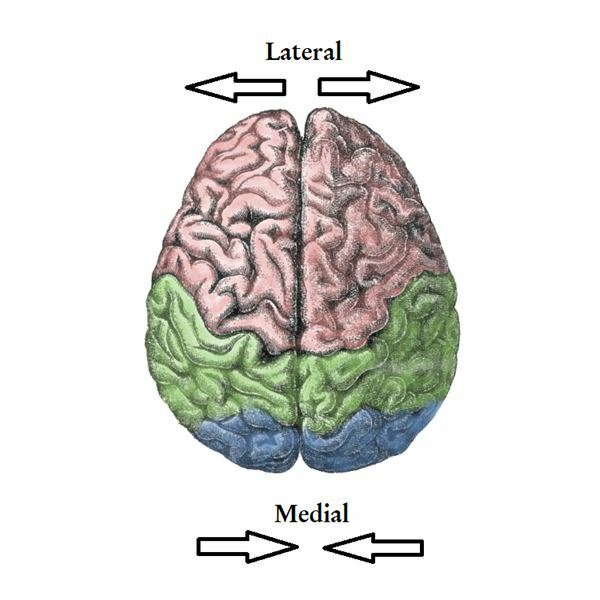 Medial means towards the center of the brain, while lateral means towards the side of the brain. When drawing a diagram, medial would be drawn with two arrows pointing at each other, and lateral would be drawn with two arrows pointing away from each other. The cerebellum is the second largest part of the brain, found underneath the occipital lobe. It looks different from the cerebrum — it has more ridges, and looks like it can be separated from the rest of the brain. The last part of the brain, the brain stem, touches the temporal lobe and cerebellum. After learning the basic anatomy of the brain, the next step is to associate the four lobes of the brain, cerebellum and brain stem to the different functions. This study guide will go over the various functions of the brain that were covered in the brain function lesson plan. Besides writing down a list of the functions, try writing them alongside a picture of the brain, to help remember which lobe is responsible for which action. The frontal lobe, on the left hemisphere, is also the location of Broca’s area. This is a region for language, involved in forming coherent words and sentences. Part of the motor cortex is also in the frontal lobe. In addition, the frontal lobe does have some involvement in emotions. 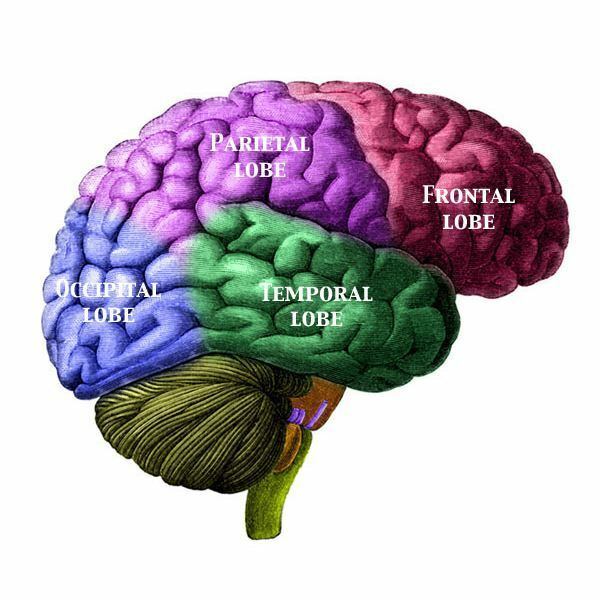 The temporal lobe is located behind the frontal lobe and below the parietal lobe. The main thing to remember about the temporal lobe is that it is involved in memory, as it contains the hippocampus. 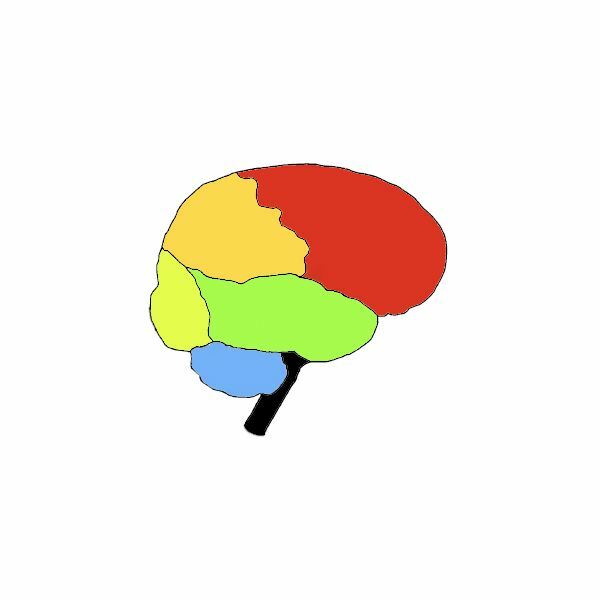 The temporal lobe also contains a language section in the left hemisphere: it is called Wernicke’s area, which is involved in understanding language. The other main function of the temporal lobe is hearing. The last lobe of the cerebrum is the occipital lobe, which is located at the back of the head. The occipital lobe’s main function is vision, which includes the visual-perception system. The occipital lobe can also discern color and movement. The brainstem is connected to the spinal cord and is located in front of the cerebellum. The brainstem passes signals between the cerebral cortex and the rest of the body. Remember, the cerebellum is separate from the cerebrum. Although the brain stem is the small, it is responsible for many of the involuntary actions that are needed to live. This is just the beginning of learning how the brain works!